Brindley Chains is a well-known and well-respected company that has been supplying effective and quality products and services to various industries for many years. Brindley Chains has been the sole UK importer for a range of products manufactured and supplied by global company, Pewag. For more than 26 years they have built an incredible partnership to provide customers with a first class service and a fantastic range of products. At Brindley Chains our range of chain products include chain slings, tyre protection and traction chains, load lashing equipment, shackles, special chain tags, and more. Please visit our website to view our complete range and to find out more about our products and services. The Pewag Winner Grade 10 chain sling system benefits from advance technology that enables an increase in load capacity of 25% when looking at a comparable Grade 8 system, and all at a very similar price. We offer a comprehensive selection of sizes, from 5mm to 32mm, which can achieve load capacities from 0.8 tonnes right up to 85 tonnes. We also stock a wide choice of additional components to suit an extensive range of applications including the VXKW combined master link and shortener assembly. For more information please contact us or download the Pewag Winner G10 brochure from our website. Brindley Chains has been selected as a main agent in the UK for NItchi & Eller chain hoists and our stock includes the Economy Line Nitchi E50A and Eller PH2, the Premium Line Nitchi H50A and Nitchi and Eller’s complete range of PR1 lever hoists. Both Nitchi and Eller hoists represent excellent quality and value for money with Eller being slightly more economical. 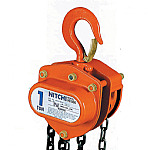 We have the facility to service both Eller and Nitchi chain hoists and also stock a wide selection of parts and spares. Please contact us to discuss our range of hand and lever hoists in more detail. We stock an extensive selection of Pewag stainless steel chains and fittings, all of which have been fabricated to the highest specifications and have undergone thorough testing. 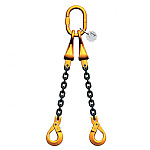 Products include pump lifting chains, Inox stainless steel chains, Inox stainless steel sling components, sling chains and swivel lifting eyes. Each stainless steel product features a batch number and manufacturer mark for complete traceability, complies with the Supply of Machinery Safety Directives requirements and comes with full operating instructions and relevant EC Declarations of Conformity and Thorough Examination certificates. Ensure your goods are transported in the safest possible way with our selection of high quality lashings from Austrian manufacturer, Pewag. 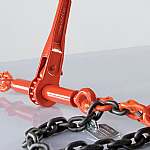 Our choice of lashing chains and components, such as load binders, connecting links and clevis turnbuckles, are available in various grades to suit a variety of load capacities. On our website you will find full details of the lashings and fixings we have available, including common load friction factors, allowing you to select the correct equipment for your particular needs with ease. And you can be rest assured all Pewag systems meet or exceed both British and European standards. We can provide a wide range of Pewag Profilift lifting and lashing points with many different options available. Just some of the products we have to offer include the Profilift Alpha, Beta, Gamma, Delta, AOR type lifting point and RGS type alloy eye bolt. It is also worth noting that all of our lifting points have been designed and manufactured with specific accreditations in mind, including the Machinery Directive 2006/42/EC and EN1677-1. If you have any further questions don't hesitate to visit the website. We stock a variety of mechanical handling systems, including bucket elevators and scraper chain conveyors. We understand the importance of providing a tailored service and customers are reminded that we can offer a free site survey for everyone looking to install a bucket elevator system. Our chain conveyor systems can be utilised for a range of different applications but are specifically suited to those that require a particularly durable solution. To find out more please visit the website or you can contact us directly. 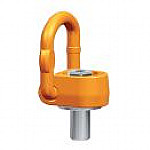 We stock a wide range of shackles with options to suit a variety of different applications. These include the black pin fed spec shackles which are available with both safety pins and screw pins. 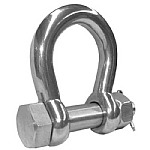 We also offer a range of stainless steel shackles with options including chain link shackles, safety pin bow shackles, screw pin D shackles and safety pin D shackles. To find out further information on any of these products, including detailed technical specs, feel free to visit our website. Alternatively, you can contact us directly. We stock an extensive range of high quality, reliable chain tags with options to suit every customer. Our chain tags are available in G8 and G10 versions with customers able to choose from designs based around an 8 and 10 pointed star. It's worth noting that the tags have been designed with durability in mind- ensuring they can withstand the stresses of on-site work. Furthermore, our tags have a space in which vital details can be stamped, for example the sling indiction number, chain diameter, etc. We can provide an extensive range of products which are suitable for use within forestry applications. 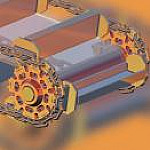 These include chains, hoist chains, conveyor chains, machine tyre traction chains and logging chains- just to name a few. All of our forestry products offer exceptional quality, reliability and safety. If you'd like to learn more you can contact our customer service team directly. It's also worth noting that our website contains a wealth of information on all of our products and services. Our snow chains can be used with the majority of vehicles and provide the necessary traction required when driving through snowy or icy conditions. 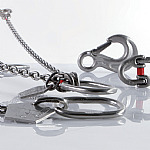 The chains themselves offer exceptional quality and fantastic value for money. We also provide Autosocks which are an alternative to snow chains and can be used on vehicles that are not compatible with chains. The Autosocks can be fitted quickly and easily and provide all the same protection and functionality as our snow chains. More information can be found on our website. If you've any questions about Brindley Chains Ltd products or services feel free to ask them here.